We all have those friends who walk around with busted screens on their phones. How often do those same friends try to show you something funny they found on their phone or social media, but you can’t really enjoy the content because of their damaged screen? This probably sounds all too familiar. 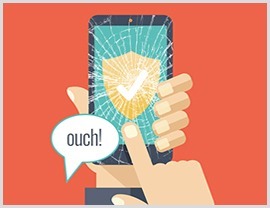 No one enjoys have a cracked screen, so make sure you are protected from potential damages! In this blog, we have taken a look at the numbers behind how one becomes a member of the dreaded Cracked Screen Society. Don’t let this be you! 1. 45 percent of smartphone users will sustain accidental damage to their phone. It goes without saying that this is a relatively large percentage of people who are dealing with damaged smartphones. While not specific to cracked screens, accidental damage can refer to any number of debilitating damages for your smartphone. With the statistics showing that it is nearly a 50/50 split whether or not you will damage your smartphone in some way, it is best to avoid the risk of unneeded additional costs of replacing your smartphone. 2. You are 16 percent more likely to break your phone if you are in the 18- to 24-year-old age range than any other age bracket. This statistic, especially, hits home for college students. If you think about it, college students are much more active in terms of walking from class to class or being outside and active; all of this leads to the potential for an increase rate of smartphone damage. Another characteristic that seems to follow college students around, whether deserved or undeserved, is that they are more reckless with their personal property. Whether the latter is true or not, the numbers lead us to believe that damaged devices are more common among the 18-24 age bracket. 3. On average, smartphone users break their phone roughly 10 weeks post-purchase. If you are like me, this statistic is relatively alarming. I mean just think about it, if you purchase a smartphone you typically treat it like gold right out of the gate. But with this statistic we are shown that, on average, you damage your smartphone a little after 3 months into your ownership. That is an extremely unsettling fact! 4. 38 percent of smartphone users drop their phone while transferring from their pocket to their hand. Think about it, how many times have you been receiving a phone call or text with your phone in your pocket and you attempt to hurry and remove your phone to deal with the call? For most of us, this is not an uncommon occurrence. Along with the hurry of trying to shut off your phone quickly or to answer that call, it requires a significant amount of wrestling around with your phone in your pocket and that can result in you not gaining proper control of your phone and dropping it. It’s fair to say that this has probably happened to most of us! The statistics mentioned above are enlightening… to say the least. So the question is, how will you combat the reality of the aforementioned situations? Not only is it important to avoid becoming another statistic, but it’s important to save yourself a lot of money and the connected headache! National Student Services, Inc. helps you avoid the risk of having pay more out of pocket to replace your smartphone! Let us help you avoid becoming a member of the Cracked Screen Society with an insurance policy on your smartphone!